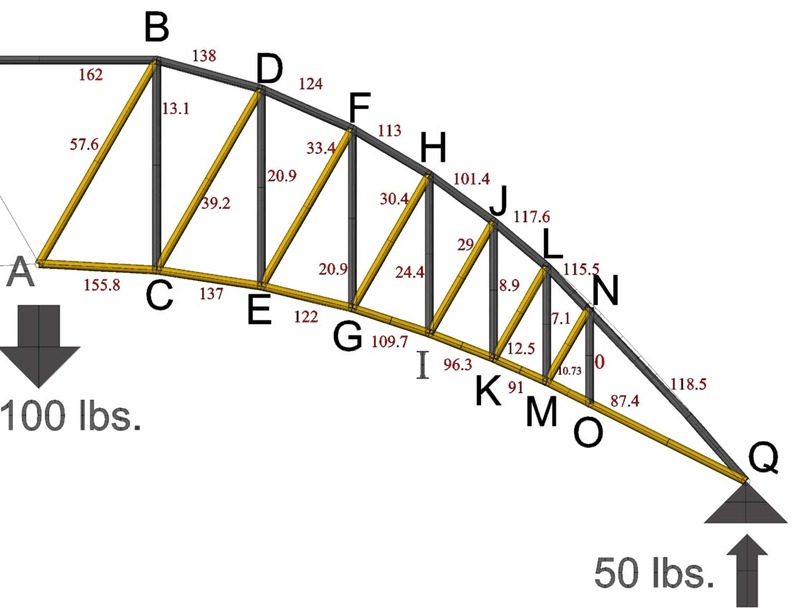 The Analysis of a Truss. I am embarrassed to tell you that I spend an entire day working out an analysis of the truss below. It becomes a sort of meditation. If you do not derive the same pleasure from a tedious math problem, perhaps you could vote on whether or not you might spend, say, $10 on a java program that would allow you to design your truss with a little knowledge. In the real world, engineers spend lots of money on cool software to help them do their jobs. The Unexamined truss is not worth building? To evaluate a truss like this one, you have to use trigonometry and physics. The sum of the forces in the vertical and horizontal forces have to equal zero if a particular point is not in motion. In physics, you often simplify the problem to get a reasonable answer without an unreasonable amount of work. To that end, I tip the truss upright and analyze only one truss. After practising on a simpler version, I went ahead and made a variant of the Pratt truss here. All the diagonals are at 60° and the other struts are vertical. To simplify the calculation of a curving arch, I assume straight lines between the points which approximate the curve. I am not going into a great deal of detail here because even I made a couple bridges without doing this analysis, but if you get serious about it, it would be a good idea to 'do the math' as it were. It may be beyond the scope of the assigment for many of you middle and high schoolers, but if you submit an accurate stress analysis of your truss, you're sure to score some extra points with the instructor. I plan to build this bridge using round toothpicks and a method of affixing them that will be suited for compression and tension joints. I used a ficticious 100 lb. weight at the center of the bridge for my math problem and worked out each joint. The amount of weight at that center point is a 'scalar' quantity. All the numbers can be thought of as percentages of the load. It really is just to show which members are in tension ( pulling at the ends) and which members are in compression ( pushing at the ends). So, for example, on join DE, the the load were only 10 pounds,the force in that link would be 2.09 instead of 20.9. That member is colored grey and it is in compression. I have colored the members in tension a gold color, and the ones in compression grey. If I had more than a couple of these to do, I would devise a program to calculate the forces on each member.